Location: Near Hunterville in the heart of the Rangitikei – Manawatu, Rathmoy farm borders the spectacular Rangitikei river. About your host at Rathmoy: Mark and Andrea Grace, Owners. Rathmoy is a sheep and beef farm that the Grace family has farmed since 1935. It was bought by Mark’s grandfather George Russell Grace. “Whaka” the land where the lodge is located, was purchased in 1938 by Mark’s great grandfather Thomas Duncan for his daughter Jeannie. After Mark travelled overseas, he decided to share a piece of Hunterville’s paradise and opened the farm for tourism. 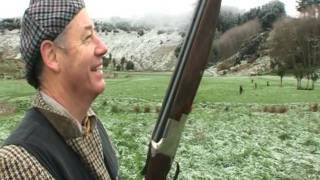 He loved the traditional English style pheasant shooting and thought Rathmoy would be a perfect place for that activity. In 2006 he created the Game Pheasant Preserve and the Lodge by the river was built. The Lodge is run by Mark and Andrea Grace. The couple met in 2010 when Andrea came to visit Rathmoy while hosting an Argentinean reality TV travel show. They were married in Argentina and live in New Zealand on the farm. Hunting experience at Rathmoy: Get your foot in the door and experience some of the best pheasant shooting in the southern hemisphere. Whether you prefer fast snap shooting in deep gorges, tight shooting through trees, or perhaps you like to watch the birds take flight for a few seconds before raising your gun, Rathmoy is the place to be. Our lodge at the edge of the Rangitikei River and at the foot of soaring white papa cliffs is a perfect and inspiring location before and after the shoot. Click here for quick link country guide. After Mark travelled overseas, he decided to share a piece of Hunterville’s paradise and opened the farm for tourism. He loved the traditional English style pheasant shooting and thought Rathmoy would be a perfect place for that activity. In 2006 he created the Game Pheasant Preserve and the Lodge by the river was built. The day begins with an 8:30am briefing where we run through the day’s programme. There is a safety briefing and the guns draw for their pegs. The day finishes with the team coming together on the Lodge deck for a few quiet beers to cheer the ones that got away, and to toast the ones that didn’t. Every gun is invited to join us for a four-course dinner and accommodation at the Lodge after the shooting. What are the fishing/hunting seasons in Manawatu-wanganui, New zealand? For accommodation in Hunterville look no further than Rathmoy. Rathmoy Lodge provides a private accommodation retreat in the heart of the Manawatu-Rangitikei region. This is the perfect relaxing hideaway for families, couples, or groups of friends wanting to enjoy the privacy of having the Lodge to themselves. Click here to view your accommodation. To select and book the top suggested hotels and accommodation in the area when hunting at Rathmoy click here. by car or public transport to Rathmoy.